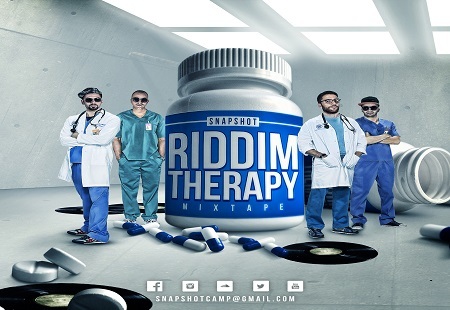 SNAPSHOT PRESENTS: "RIDDIM THERAPY MIXTAPE"
Riddim Therapy is a musical project of the Snapshot boys organization and it has been released for free download the 5th October on the web site snapshotmusic.it. The 14 tracks are loaded with Reggae Music sounds and influenced by the Dancehall beat. The work has been developed on the baddest Riddim of the moment, it starts with "RMND", a song in which the Snapshot boys relive their love for Reggae Music honoring the artists and the sounds, that have inspired the whole project. This album fully reflects the 4 singers' different minds and sides, they, mix the Caribbean influences with those from where they grew up. Riddim Therapy è un progetto musicale,dei ragazzi del collettivo Snapshot rilasciato il 5 Ottobre in free download sul sito snapshotmusic.it,14 tracce del Mixtape, che passano dalle sonorità più delicate della Reggae Music a quelle incalzanti della Dancehall. Il lavoro, esclusivamente registrato sui Riddim più bad del momento, si apre con “R.M.N.D.”, brano in cui i ragazzi di Snapshot rivivono il loro amore per la Reggae Music omaggiando gli artisti e i sounds che li hanno ispirati. Riddim Therapy è un lavoro che riflette a pieno i diversi animi e le diverse sfaccettature dei 4 singers, mescolando le inevitabili influenze provenienti dai Caraibi con quelle nostrane.